What a backwards, smelly, craptastic, third-world, hell-hole Antiqua is! We had high hopes for the place when we stepped off the ship. Passengers were greeted by an ultra-groovy steel-drum ensemble but that's where the fun ended. Once through security, we were set upon by men in blue shirts who were waiving what appeared to be Waffle House menus in our faces. Turns out the men were taxi drivers and their pursuit of us was Paparazzi-esque in nature. I felt like Britney Spears on her way to the grocery store. A simple "No, thank you" was not the answer they wanted to hear. I tried "We already have a tour booked" (even though we didn't), but that would only work in the short-term. Miserable, menacing woman asked to braid my hair. The raw sewage odor emanating from the harbor was overwhelming when combined with the humid air. White tourists, filled with guilt, plastered smiles on their faces and pretended not to be intimidated by the hostile Antiguans. I think the Safety and Security Guide handed out by the Welcome Center summed it up best, "Remain alert, maintain a low profile and trust your instincts." We trusted our instincts and hightailed it back to the ship for a mid-morning workout. We claimed we would head back on shore later in the day for a Wadadli-- the local brew-- but secretly we knew we wouldn't. 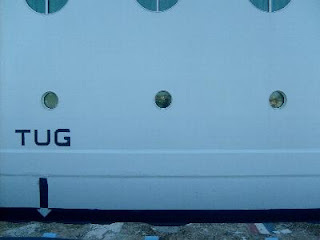 Antigua is best enjoyed from the safety of a 90,000 ton vessel. The gym on the Serenade of the Seas is state of the art, manned by two super-buff European dudes named Hans and Franz or Bjork and Fork. After our run, it started to rain, making us even happier about our decision to skip Antigua. The only thing worse than being scared is being wet and scared. Several hours of eating and napping later, we were dressed in our nighttime casual-wear taking advantage of the bars, casino and nightly shows. The midnight "Dancing Under the Stars" event was moved indoors due to high winds-- 48 MPH winds according to the in-house television channel. We climbed to the top deck and momentarily panicked when we realized we looked like Jim Cantore reporting from a hurricane. I guess there's a reason the women at the Weather Channel don't wear skirts. That night I couldn't sleep. The rocking made me feel like I was 16 again and experiencing drunken bed spins for the first time. At times, the surf covered our porthole-- and no, that's not a euphemism. It must have been the Anitgua Gods seeking revenge for dissing their island.